The area of irrigated agriculture in Brazil in 2009 was approximately 4.453.925 hectares, and has increased on average 4% per year. According to experts the demand for food in the world will have an growing increase being 80% of the food needed to satisfy the needs of the world population in the next 25 years, will be provided by irrigated crops. The irrigation makes it possible to increase production in 3 times in compared to the production without irrigation in the same area, thus, prevents the increase in planting area to expand production, contributing to environmental preservation. The energy consumption in irrigated agriculture is approximately 25% of the cost of production, while much of this cost is generated by the irrigation pumping system. With this the growing use of irrigation pump is required systems more efficient and economic, for this should invest in higher quantities in the development of technology applied in irrigation pumps. Particularly for public irrigation districts, that has a variation in irrigated area throughout the day where the irrigation pumping system works out the optimal point of operation. Following this trend, is aimed with the carry out this work the simulation of the pumping system of irrigation district using VFD (variable frequency drive) aiming at energy savings. Was chosen as base districts irrigated containing 4 blocks of 2 ha, with 25 meters in front and 2 meters of incline between them, 2 meters of suction, 73 meters distance from the irrigation pump to the first block, with a pressure of operating in each block of 15 MCA and flow of 3 m3 h-1. With these characteristics was simulated the economic of electric power consumption with the use of VFD in districts irrigated, using the EPANET program, that it is a free software. In order to validate the simulation of the perimeter, was assembled a prototype in the hydraulics laboratory of Universidade Federal de Viçosa (Minas Gerais-Brasil) in reduced in size and with register drawer to induce the loss of load and outputs of water simulating the blocks, activated by a 5 cv motor. First was activated the motor and adjusting the records to cause the loss of load applied to the real districts, and then measured the performance of the system with 4, 3, 2, 1 open records in different settings. In next was placed VFD activating the motor and the test was repeated again, but regulating the motor speed to provide the minimum pressure required (15mca) in the last block on avoiding excessive energy consumption. With the use the VFD we obtained a percentage reduction in consumption of 8.1% for all records connected from 44.1% to 20.6% for 3, 48.4% to 35.5% for 2 and 55.6% to 40.7% to 1 record connected. These values are similar to the simulation using EPANET software, where verified to be an efficient tool for simulation of energy savings in irrigated districts. To irrigate is to supply water to crops in order to attend their water needs, allowing efficient water use to maximize the productivity/quantity of water applied. But to make the irrigation is necessary a set of techniques that, if properly planned and put into operation at the right time, will contribute significantly to increase productivity. The irrigation use promotes the increase of production, on average, 2.5 to 3.0 times, compared to the same area not irrigated, generating an increase in the property value and the gain from agriculture, that in terms of gross value can be around 5.0 times greater than in non-irrigated areas. The irrigation may cause environmental impacts when not used properly. Besides this, the irrigation is responsible for a great part of the energy consumption in rural areas. According to Moraes et al, in a study of energy saving in Minas Gerais, it was found that the irrigation could save 10% of the power consumed. For Turco et al, if the irrigation system were better proportioned, could have a saving about 20% of water and 30% of energy consumed, and from these 30% of energy savings, 20% due to the unnecessary application of water and 10% due to performance and optimization of the equipment. This economy is based on: (i) adaptation in design and management of the water pumping system, (ii) location, (iii) distance from the source to irrigation, (iv) type of material used in pipes and (v) use of flow controllers. Generally, irrigation pumping systems are projected to provide maximum flow required. Thus the irrigation pump system is also designed to supply this flow. However, not always the irrigation pump system needs to provide the maximum flow, which is defined by the irrigation management techniques and that depends on irrigation demand of the time of year, culture type, among other factors. Oliveira et al studying VFD, found a significant contribution to energy savings. The use of variable frequency drives minimizes the electricity cost in the control of the starting current and in the acceleration and deceleration time, thus expect to decrease maintenance costs, because with the use of variable frequency drives, the engines will be subject to minor electric "stress" (caused by high starting currents), i.e., less heating and smaller demands of departure. They can be operated by means of automated systems. According to Testezlaf, irrigation control automated systems with variable frequency drive become an essential tool for applying water in the required amount and in the right time, contributing to increase production and decrease the cost of it. Much of the technological innovations have as basic principles electronic devices. Over the past few years electronics has undergone a very rapid evolution, occupying a prominent position among all the other technologies. As stated earlier, the objective of this work was to evaluate the reduction of electricity cost for pumping in irrigated districts by applying different levels of automation with the use of a VFD. First, it was done a simulation using the EPANET software to a hypothetical field situation as shown in Figure 1. To perform the simulation, it was considered a unitary continuous flow of 1.66 L/(s/ha) for 20 hours, to area and slope uniforms. The dimensions of each block were 25 meters in front by 200 meters long, totaling 0.5 acres per block, 2 acres of total area, with a pumping rate of 3.33 L/s (12 m3/h), as the distance from the pump to the record of the first block was 73 meters. 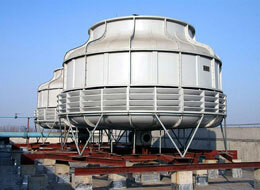 It was considered 8 meters as difference of level or geometric height (Hg) from the pump shaft to the highest point, the suction height was 2 meters, the working pressure for the record of each block was 15 mca. Fig. 1 irrigated district with 4 blocks. 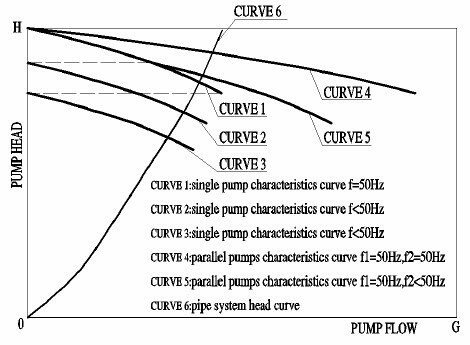 The irrigation pump was chosen based on head and flow rate found the optimal operating point, for this it was used an electronic form, which presented better performance, subsequently determined the electric motor to couple with the pump of 5 cv. After the simulation using the EPANET software, was assembled in laboratory an experiment to simulate the four irrigated blocks. Figure 2 shows the equipment and connections of the prototype of the irrigation line which supplies the 4 blocks. To carry out the perimeter automation, it was used a system with a PIC (Programmable Interface Controller) to do all the system control. Thus is possible to program it, so it can perform various tasks, such as control an electro-mechanical device, take measurements, exhibit information on a display, or simply flash lights. The simplicity, availability and low cost are the main attractions of the PIC. In this way, it was used the PIC to control a stepper motor, which is a type of electric motor used when something must be precisely positioned or rotated in a precise angle. Each configuration has a predetermined speed which is set through a variable resistor connected to the variable frequency drive that provides a reference voltage, which regulates the motor speed proportional to this reference voltage. 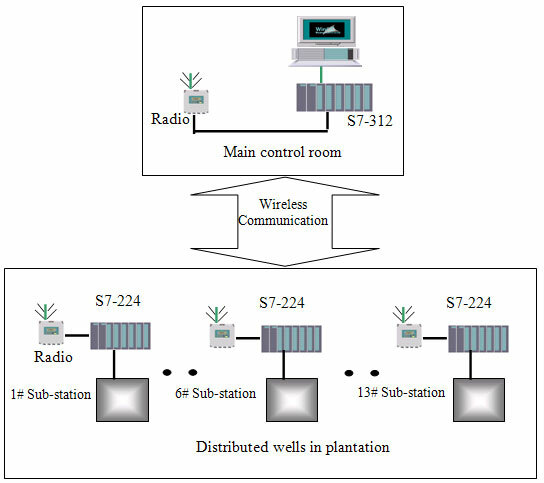 After the system installation of Figure 1 be implanted in the laboratory, a test was performed to verify energy consumption with the use of the main line for all possible combinations (15 in total) of the four blocks according to be irrigating (on) or not (off), due to the fact that the irrigation pump system without the use of the variable frequency drive, in general, have a constant energy consumption. For each combination was checked the flow and pressure for each outlet pressure after the irrigation pump and before each record of the block. Later, it was performed again the 15 combinations, but this time using the VFD that, due to the rotation decrease, kept the pressure of 15 MCA for the more critical block of the combination. For the situations was recorded the power consumed, reactive power, power factor and rotation of the motor shaft by means of a tachometer. 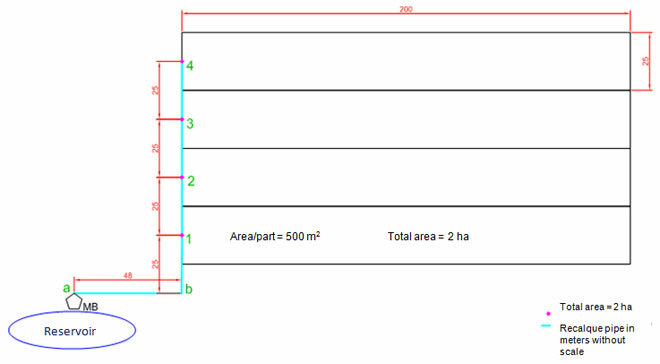 With the simulation were found the values of pressure for motor-pump and for each outlet pressure before leaving the blocks, being these values obtained for each combination of open and close of the record possible in the assembled district, as shown in Table 1. Table 1- Values found with the simulation for each point of record of each possible combination. After found the pressures that could be in a real perimeter using the simulation, in a laboratory assembled a prototype and by the pressure drops register, assembled these pressures for each combination. As far as using only the engine or using motor coupled to the VFD, always with a flow rate of 2.5 m3.h-1. The pump uses VFD demonstrated to be an effective tool in reducing the cost of electricity in irrigation pumping system for irrigated districts, in the case study, its use represented 40% of energy savings by VFDs.